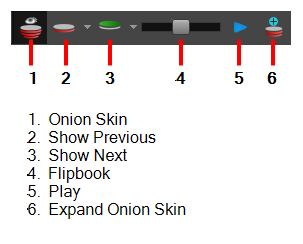 The Onion Skin toolbar displays the next and previous drawings in the Stage view. For tasks related to this toolbar, see Setting the Onion Skin and Flipping through Onion-skinned Drawings. Turns the onion skin on or off. Displays the previous panel in red. Displays the previous two panels in red. Displays the previous three panels in red. Displays the next panel in green. Displays the next two panels in green. Displays the next three panels in green. Lets you move quickly between onion-skinned drawings. Starts and stops playback of the panels. Displays more than the default three previous and three next drawings. You can see some or all of the 15 previous or next drawings. Once you set the number of drawings you want to see, it is used as the default when expanding the onion skin.You can set the default number of available Onion Skin levels in the Preferences dialog box (Camera tab, Onion Skin and Light Table section).